Easy to read in the roughest of conditions.Superb card stability. 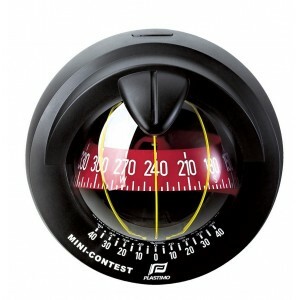 1 graduations.20 degree field of v..
To match the new cockpit designs, Plastimo has revamped the Mini Contest, one of its historic most p..
Multipurpose compass which is optimal for smaller powerboats, cars and other vehicles.The unique bui..
A small, light compass with attachments suitable for a kayak. Rubber straps with clips that attach t..
Silva 70UN, the universal compass used in its bracket as a steering compass or as a bearing compass ..
A versatile compass that can be used as a steering compass whilst placed in its bracket, or as a han.. The Silva 70UN/UNE Spare Bracket allows for your compass to be securely fastened to your boat either..